If you are a temporary visitor you will not be able to order through our website, but please come visit our store. 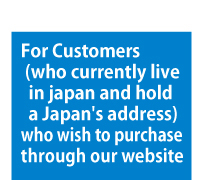 This Online Shopping Guidelines is only for foreigners who are currently living in Japan and holding a local address. Inquiries in English or Chinese will take a little more time for us to reply, thank you for your understanding. 1. 1. Before you make any purchases, you will need to register as our new member (for free)at our “新規会員登録” page. Therefore, if you have registered at any following related websites, you will no need to do it again. 2. After registering as our new user, please use your E-mail address and password which you just registered to login. Therefore, if you have registered before at any related websites as above, use that E-mail address and the password to login. ※ One account can login to all four websites. ※ Only foreigner who currently lives and holds a local address in Japan is available to register as our new user. We put the product prices and information utmost carefully on our website. However, if any mistakes happen, we will amend them as soon as possible. Customers can also cancel the orders if they cannot accept the amendments. We usually contact our customers by E-mails. However, system errors may take place sometimes, and we will not be able to send you e-mails. ※ If you have not received any e-mails from us within 24 hours, please e-mail us. 5. Inventory for used products and consignment sales. Please note that there will also have orders from our stores, there will be a possibility of sold out and reserved by other customers at the same time when you make the purchase. ※ The picture’s colors will have a few differences from the originals. If you find any products that you wish to order, please click on the button. ※ Please log in before you purchase any items. After choosing all your orders, please click on button, and you will need to fill in some of your information. You will enter a page that will want to confirm your current address. If you want us to send your orders to your current address, please click on the button as the picture shows. If you have changed your current address or you want us to send the orders to another address, please click on , and type in your new address. Please choose a date that you wish to receive your orders from the“配送希望日”box, then choose the time zone from the“配送希望時間帯”box. ※ Depends on the inventory or traffic situation, delivery might be late in some cases. ※ If you did not choose any date and time zone, we will send you the order in the shortest work days. Please enter your password again in the blank for password（パスワード）, and it will show you how many points you have left in your account. Also type in how many points you wish to use for your payment this time. There are two types of payment. One is to pay all your payment at once. Transporter: YAMATO Transport Co., Ltd. / SAGAWA Express Co., Ltd.
※After ordering online, we will send you an e-mail about your total payment. ※Please pay the payment to the delivery guy. Please print out the payment paper[払込票], or write down the number on the payment paper[払込票番号], take it to 7-ELEVEn, tell the cashier that you wish to pay the Internet payment. Write down your reception numbers[受付番号] and take it to LAWSON or Seicomart, and then pay your payment there. Write down the corporate code[企業コード]and order numbers[注文番号], bring them to Family Mart and pay your payment. Print out the integration settlement picture[統括決済画面] or write down the online settlement numbers[オンライン決済番号], bring it to the stores and give it to the cashier. ※ You can use this payment method, if your total payment of your orders is under ¥300,000. 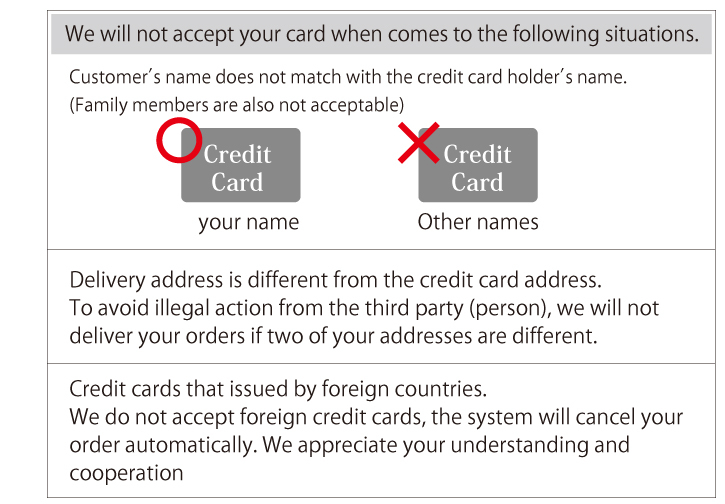 ※ You cannot combine this method with credit card payment method. ※ After confirming your payment, we will send your orders to you, so please make sure your delivery date is correct(within a week). ※ Convenience store payment will not cost you any other charges. ※ We will e-mail your total payment amount to your mailbox. ※ If we did not receive your payment within a week, we will delete your orders directly. After you finish your order, we will inform you the inventory of your order by e-mail. Note: Please wire the payment after your confirmation. ※ We will send out your orders after your payment, so please be careful when you choose the delivery date. ※ You will have to pay for the transfer charge fee, thank you for your understanding. ※ If we have not received your payment within a week after your order, we will cancel your orders. “Credit Card payment” and “Shopping Credit payment” is two different payment methods, please make sure your choice. You can pay by monthly installments without applying a credit card. (Orico, JACCS or Cedyna ). It usually takes 2~3 days to review your applications. (They will contact you by phone calls to confirm your information, however, there is no need to sign or seal on any papers). The maximum of your divisions for payment is 60 times. ※ If the total amount of your payment is under ¥300,000 or your monthly installment is under ¥3000, you will not be able to use this payment method. ※ If you wish to pay with two methods, you can only choose Orico or JACCS. ※ Your delivery address can only be your home address or your work office address. ※ Delivery is depends on the result of your application. The shortest time for Orico to review your applications is 3 minutes; this can also speed up the delivery time. Its typing system is also very easy for customers to use when they apply online. Your payment of installment will start two months later after your application. You can designate the date when do you want JACCS to phone call you by. Employees, full-time housewife, people who live on their pensions and adult students can apply. You can choose to pay your bills on 6th or 26th. You can also change your installments to a lump-sum payment. At the end, you will come to the order confirmation page. Please check carefully of your order information, if there is no problem, please click on to complete your order. After receiving your orders, the system will automatically send a “自動返信メール（ご注文）お客様控え”e-mail to your mailbox. ※	If you did not receive it, please contact us by e-mail. After sending the “自動返信メール（ご注文）お客様控え” e-mail to you, we will also check the inventory of your order and send you a “ご注文確認メール”e-mail within 24 hours. ※ Before the “ご注文確認メール”e-mail, your orders are still in progress, we need to check if the product has already been reserved by other customers or if we still have them in stock. “ご注文確認メール” e-mail will be the final confirmation of your orders. When your orders arrived, please confirm the contents of the package. If there are any problems or missing items, please contact us by e-mail. If you wire the payment from convenience stores or from banks, your order reserve period will be a week from the day we send you the “ご注文確認メール”e-mail. Please notice that we will cancel your order if we did not receive your payment by deadline. There will also be a few differences of the payment deadline in some cases, please check your “ご注文確認メール” e-mail carefully. We do not accept orders from overseas. Only if you can follow our payment rules (Credit cards, cash on delivery, wire transferring or pay at convenience store) and also you can provide us a local address in Japan in order us to send you the orders. Receipt will be issued by your credit card company. Receipt will be issued by forwarders. Receipt will be issued by the convenience store that you pay your payment. ※ If you need a receipt that issued by Map Camera, please contact with our staff.